It’s really useful having the magazines that inspire your crafting at your fingertips, it could also be the perfect place to store your craft paper scraps! Today Maxine shows you how to use the First Edition Pick n’ Mix designs to personalise your own magazine holders. Magazine Holder, we bought 4 for a £1 from Ikea. 1. Firstly, choose a paper design in your First Edition Pick n’ Mix 12x12 Paper Pad and put it on your desk upside down. Place your magazine holder onto your paper, draw around it with a pencil and cut out. Repeat this step for both sides. 2. If your box is bigger than the 12 x 12 paper pad, cut a strip of the same paper for each side to fill the gap. Adhere your pieces of Pick n Mix paper to the magazine holder with Dovecraft Perma Fix tape. 3. Use your box as a template to draw around the front and back of your holder onto the back of a coordinating piece of Pick n’ Mix paper. Cut out and use Dovecraft Perma Fix tape to stick your sheets to your holder. 4. If you are working on a bigger holder and there is a visible gap, use a strip of coordinating paper to place across it. Repeat his step on the opposite side of the box and stick each piece to your holder. 5. If you would like to decorate the inside of your holder, measure around each face of the holder onto the back of your chosen Pick n’ Mix sheets. Again draw around, cut out and securely stick each piece to the inside of your holder. 6. Die cut the 3rd largest die from the First Edition Torn Edge die set onto a Pick n’ Mix sheet. To create the appearance of a frame, die cut the smallest die in this set on the centre of your square. Adhere 3D foam tape to the back of your frame and stick it to the front of your magazine holder, ensuring to leave the top edge open. 7. Cut a piece of Pick n’ Mix paper down to 5cm x 6cm, to fit into the frame. Punch a circle on a coordinating sheet of paper using the Fiskars Power Punch 1.5”- Circle. Fold your circle in half and adhere the straight edge to the top of the paper to create a tab. This is a fantastic way of adding character to your magazine holder! 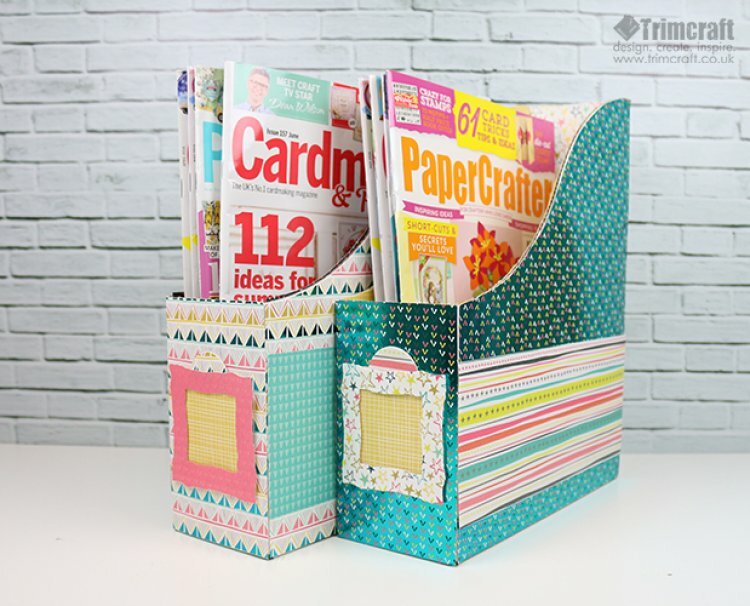 We’d love to see your upcycled magazine holders so remember to upload your versions to the inspiration area and when uploading to social media, to #Trimcraft.